Like an early '60s b-movie Slaughter Film has grown to an unimaginable and monstrous size - reaching episode 300 - with the help from nuclear radiation! The Horror Duo have planned to celebrate this momentous occasion with a bang, by discussing a pair of films that shed some light on the Cold War fear of nuclear holocaust and the fall out from the Chernobyl disaster. Forest will be covering the harrowing depiction of a world blasted by nuclear weapons with Threads, which plays out a WW3 scenario in which Great Britain is the target of such weapons. 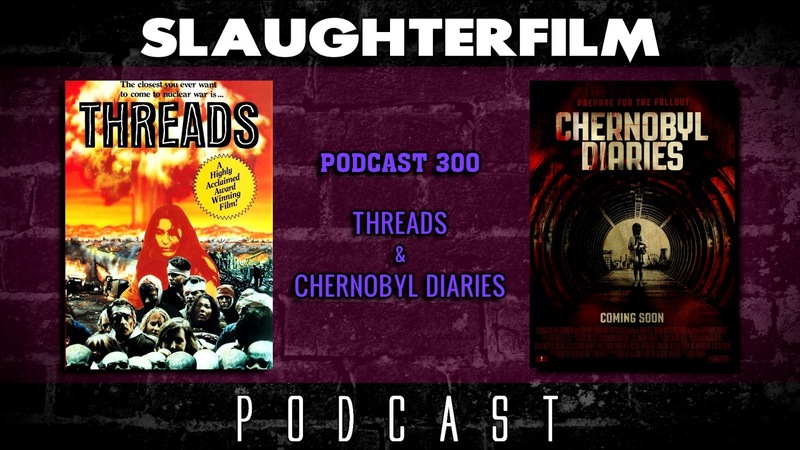 Cory talks about Chernobyl - the disaster that nearly annihilated Europe, while sharing his thoughts on the 2012 pseudo-found footage film Chernobyl Diaries. For more Slaughter Film news and reviews, as well as show notes and special events, make sure to visit our website; SlaughterFilm.com.